Josh Heward tests equipment in preparation for his upcoming PolarConnect event. Observation Hill, McMurdo Station, Antarctica. 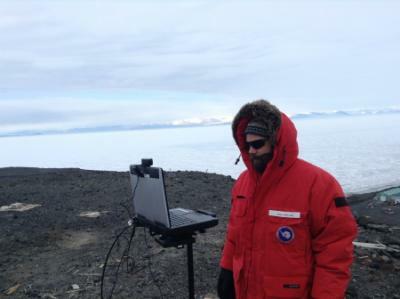 Credit to Read: Photo by Jim Madsen, Courtesy of Joshua Heward (PolarTREC 2016), Courtesy of ARCUS PolarConnect transports students and the public to remote polar locations to learn about exciting polar science through real-time Internet presentations from the field. PolarConnect utilizes an Internet platform called, Zoom, that supports online slide presentations, voiceover IP, audio, and text chat functions to allow for interaction with educators and researchers during their PolarTREC expeditions. PolarConnect participants have the unique opportunity to ask questions to educators and leading researchers studying the polar regions. Each PolarConnect event is archived for downloading and viewing afterwards. If you cannot participate in a live event, but think the topic sounds interesting, you can access a full archive (audio/video), as a Quicktime movie, as an audio file, and as a PDF of the slides from the presentation. These events are going on all the time! Learn about and register for upcoming events here. Teachers and their students, college students, the media, members of the public, researchers—anyone can participate in PolarConnect events. Participation is FREE and requires as little as a telephone or as much as a computer with microphone, speakers, and high speed internet for full function of all the webinar platform features. Once scheduled, each PolarConnect event is advertised via the Polar Education List and additional email lists. Participants wishing to join should use the online registration form to sign up for the specified event. Once registered, the participant will receive instructions for participation and computer set up via email.